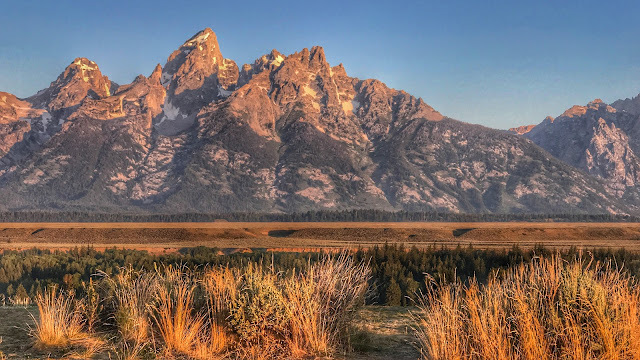 Next stop is Grand Tetons National Park. These elegant, majestic mountains have brought tears to my eyes. We've also been here before once for each RV! But,both of the other times were just passing thru.This time we arranged a rendezvous with my oldest friend. I mean, friend I've had for the longest time ... we're both old! Lanz and I went to Jr. High together in Fort Lauderdale, Florida, and we've stayed in contact over the years. He now lives in California and loves to travel - usually overseas. When he asked where would be a good place to take a trip in the US, I said we would be in Wyoming in July/August and had some time. Yes! He and Blake would love to visit Yellowstone and Tetons, so he booked a trip and we arranged to meet them in Jackson. He made arrangements for a river rafting trip for a day and we went along. Cool! Jim and I rarely splurge for such things. Actually, we usually just don't think of it. We're on the road to work, and it's just how we live. We don't have the tourist frame of mind. We started the day by going up the mountains in a Tram. Then came the river trip. We saw several moose during the day. After Lanz and Blake left to go back home, we checked our maps and found a Winery nearby! What a delightful place. We just sat and watched the horses and the beautiful view as we drank some wonderful wine. This view still brings tears to my eyes ... these mountains are so beautiful. 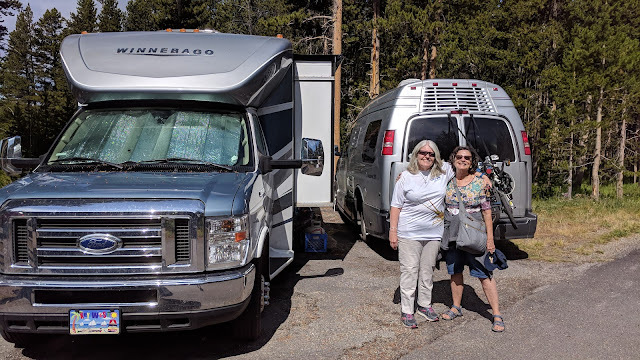 Our good friend, and long-time Florida dive buddy, Debby Bradford, is now a fulltime RVer and she is work-camping in Yellowstone this summer. This is her second summer there and we are thrilled to be able to visit and see it thru her eyes. We scheduled our visit to coincide with her days off work - Wednesday and Thursday. We had been to Yellowstone once before also in our first year on the road, but we only spent one day there. We saw Old Faithful and that's about it. 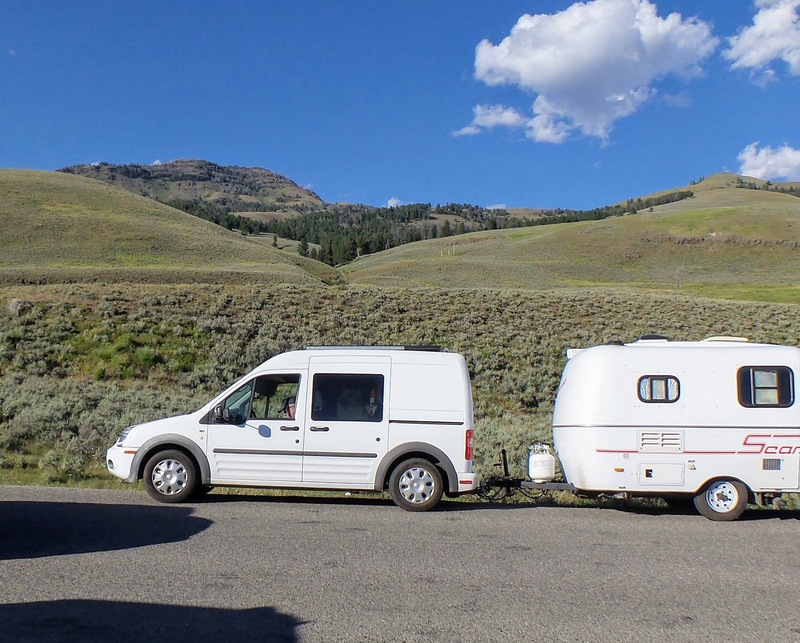 Yellowstone is pretty crowded this time of year, so we were extremely grateful to have a place to park with Debby in the employee campground. Of course, it really helps to have a little rig like ours that can fit in any parking spot! Debby's RV in the employee campground, our camper van fit in her car spot. What a great tour guide she was. We didn't even look at a map. We told her we wanted to see Grand Canyon of the Yellowstone and that's all we knew. We are not early risers! 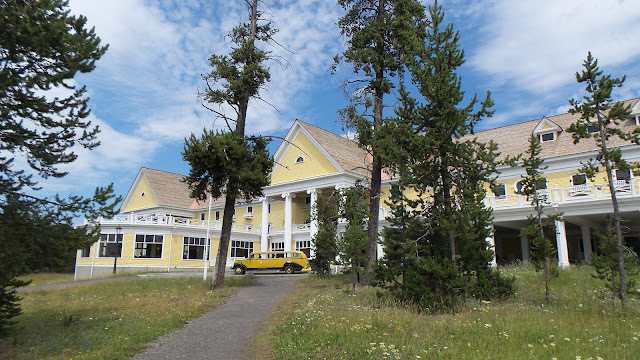 So,our first stop was for lunch at Lake Yellowstone Hotel. Beautiful place, beautiful view, yummy lunch, and time to catch up with our old friend. Does it get any better? After lunch we visited several of the thermal pools around the lake - at "West Thumb" (see the map above.) The colors of the pools are even more dramatic for being right next to the lake. 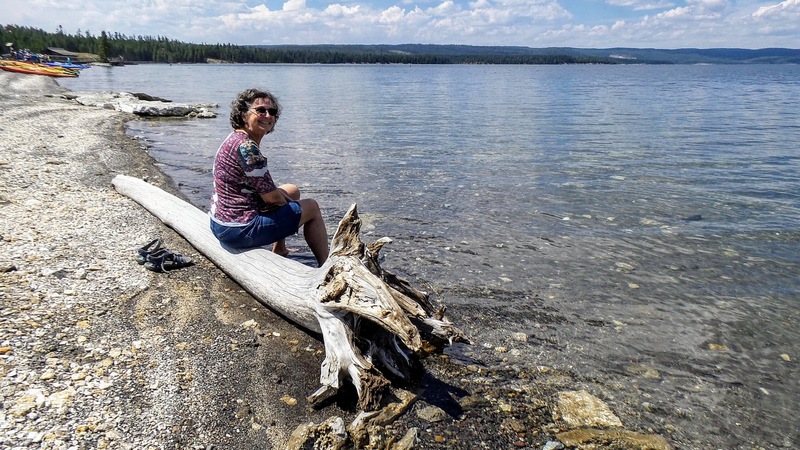 I didn't even realize there was a big lake in Yellowstone park. It's not hot water! But, Debby knew about it and made sure we got booked for a boat ride on the lake. We will always try to add some water to our visit wherever we are! 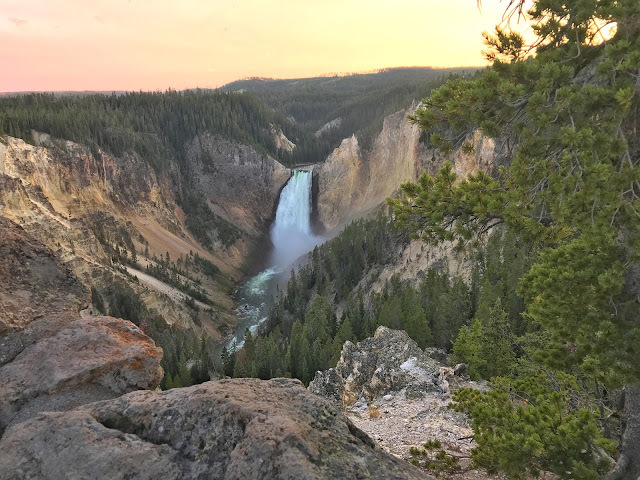 She planned the Grand Canyon of the Yellowstone for the end of the day - best for photos! The next day, Debby took us in the other direction. She said there were more Bison to be seen along with spectacular views to the north. She was right. Once the FMCA rally was over on July 22, we're on vacation! Our next "gig" isn't until August 27 in Shawnee, Oklahoma. 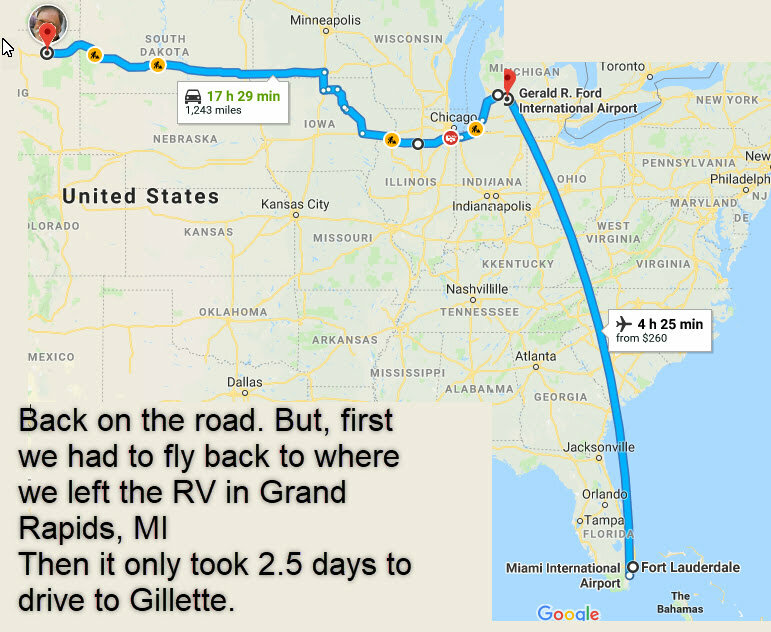 That's a little over 1,000 miles - 3 days of driving - and we have 35 days to get there! I know I'm short-changing these 10 days by lumping them together into one blog post, but I'm writing this in the middle of August and so much more has happened, if I don't get something written quickly, I may never get it in here at all! In the 10 days after FMCA, we visited Devils Tower, Yellowstone, and Grand Tetons. We took advantage of lots of walking paths and even got up for sunrise and walked all the way out to the east of the tower for some great views. I even thought ahead and downloaded the movie "Close Encounters of a Third Kind" while we had good Internet back in Gillette. I bought it from Netflix and downloaded it to my iPad so we could watch it even without any connection while in Devils Tower park. 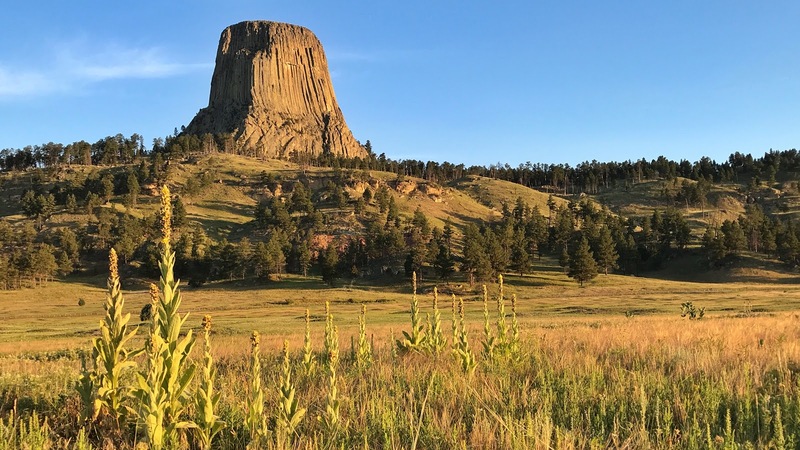 It was so fun to watch that movie about Devils Tower and be able to look out our window and see the real thing. 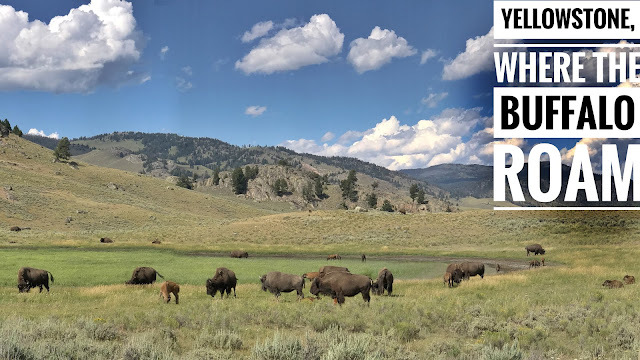 I can't do it, I can't lump all 3 national park trips together :-) Here's a video where I put together everything we did in Wyoming, but then I'll write separate posts for Yellowstone and Grand Tetons. FMCA RV rallies is where we started giving seminars while on the road, that was in 2005, and they've asked us back for every rally since. We see a lot of old friends, but are also amazed and all the new faces that are at these rallies. It is interesting, over the years, to see which seminars are the most popular. For the first few years, the only topic we taught was Internet on the Road - how to use Wi-Fi. Attendance was always >200 for those. The largest audience we ever had was for a Picasa seminar in 2010, we were told the count was 740 people - Picasa is not even available any more. Then came Facebook as our most popular topic - and we rarely even teach that now. For the last couple of years, Smartphones: What does that button do? has been the most popular topic. At this last rally, Google Photos seminar attendance surpassed any of the others. Here is our Google Photos audience interacting with us as we demonstrate that Google Photos also stores video. 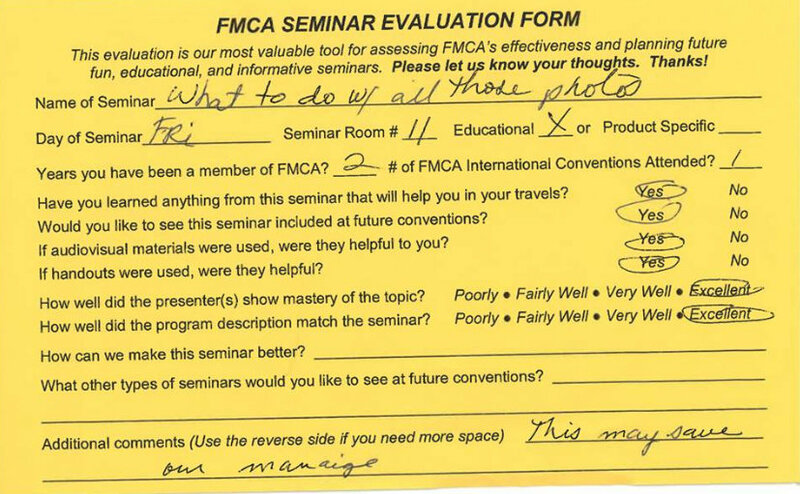 Sometimes an evaluation catches our eye. Check out what this person wrote in the comments: "This may save our marriage" :-) I wonder what exactly they were referring to? Sounds like a great seminar title, "How Google Photos can Save your Marriage!" 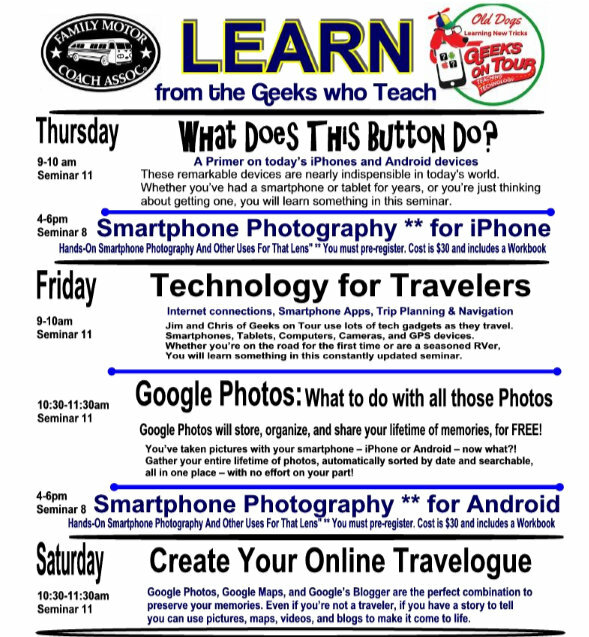 You can see where we are scheduled to present live seminars by looking at the schedule section of our current newsletter, or on our calendar, or on our map! 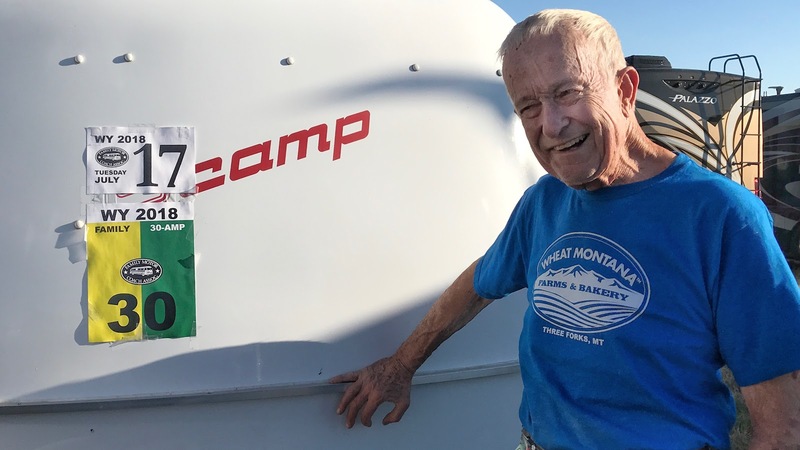 Once upon a time a man named George won his battle with cancer and decided to live a life of adventure. 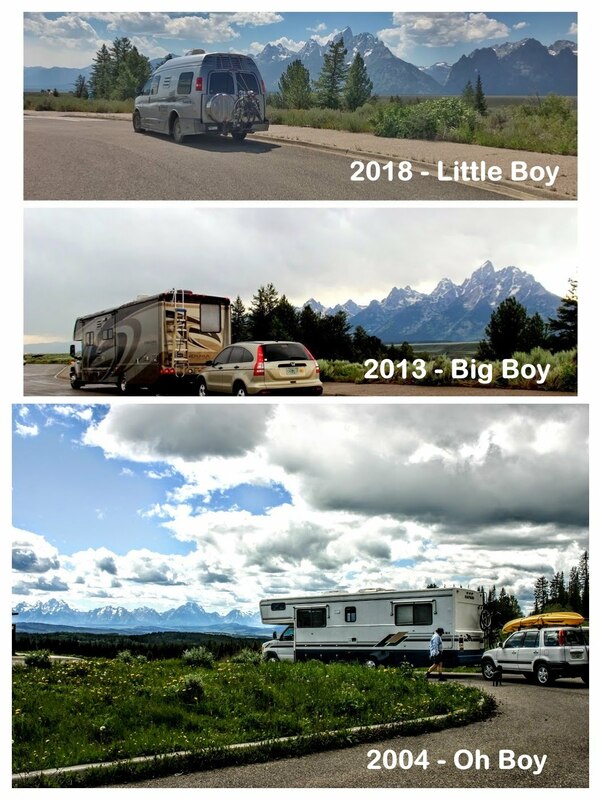 He bought a used Tioga-brand RV and took to the road. 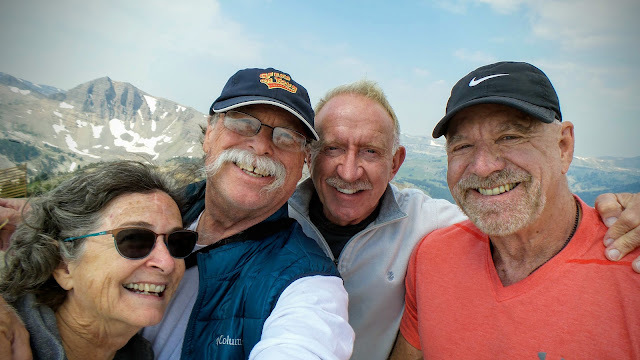 His cancer support group friends convinced him to keep a web-log (blog) so they could follow his adventures. He did as they requested and called his blog Vagabonders-Supreme. George was a solo traveler, but he didn't feel alone. Just as Don Quixote had his trusted steed, Rocinante, George had his Tioga RV. He took to calling her Ms. Tioga, and then followed Mr. Chips - his computer that made blogging possible, Mr. Datastorm was his satellite Internet dish, Mr. Mavica the digital camera, Mr. Trek the bicycle, Mr. Onan the generator, and more. Thus was born the Vagabonders Supreme Team. George and his team had lots of stories to tell. Like when his adventures took him south of the border to Santa Rosalia. He liked it there so much he returned again and again. 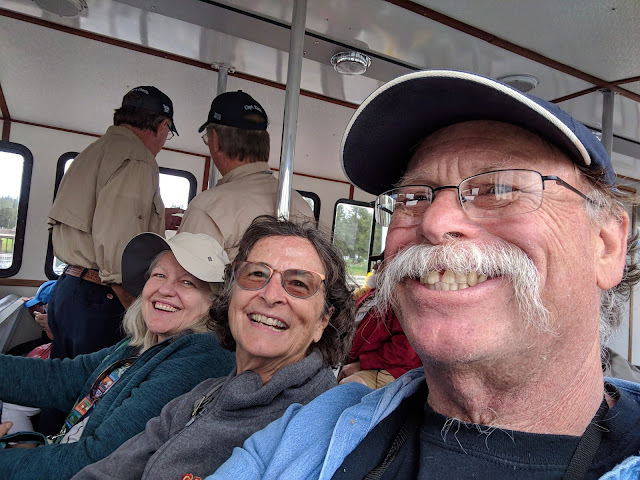 In his blog, George shared lots of information about RVing, like how he tilted his solar panels so they receive the most sun. Lots of people started following George's blog, thousands of them! It was like he carried his own clubhouse around with him. If he ever wanted company, all he had to do was post to his blog and people would leave comments back. This was back in 2004, when there weren't thousands of RV bloggers! George was a pioneer. A BIG thank you to Paul from Florida!Wow, Paul. Your help was soooo great. The Team is so grateful to you for phoning Tucker's Garage and arranging for our towing. Imagine that, everybody! We were rescued by using space station internet communication. Man-O-Man! We also started blogging in 2003. George was our inspiration. We were one of his devoted followers, we read every post, looking forward to his news each day. He was a celebrity. We also learned a lot about the Blogger system from following his posts. We first met up with him in 2004, right here in Devils Tower park. I was like a nervous school girl all a-twitter over meeting a movie star. We also met up in 2007, see that blog post and video here. How are you and Ms. Tioga?Hope Mr. Onan is feeling better.Have a good stay. OMG, Tioga-George's blog is so well read that even the local police follow him! George is still RVing, and still blogging. He doesn't own Ms.Tioga anymore, he has a small Transit van towing a small Scamp trailer. We don't follow him as regularly as we used to, but sometimes he sends out an email with his location. 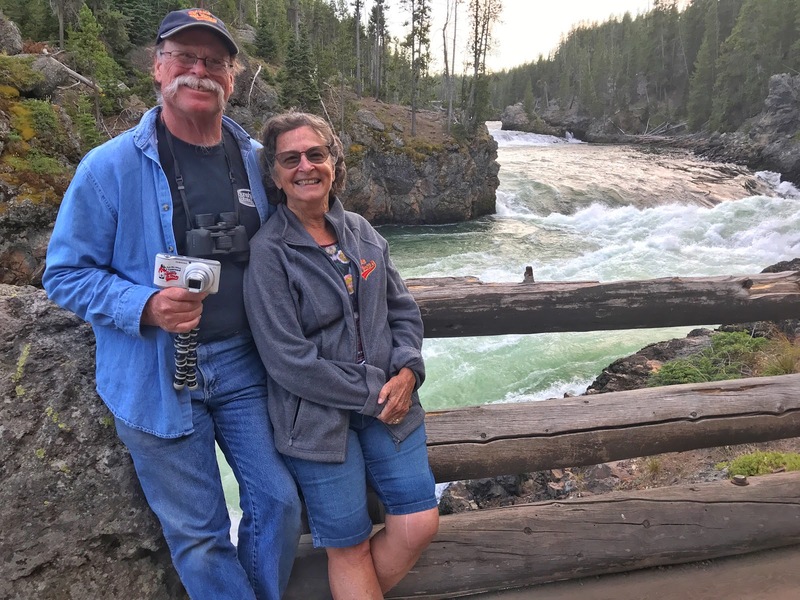 We noticed that he was in the Montana area and we planned to be in Wyoming, so we sent an email response suggesting we may be able to meet up. He said, "Sure!" 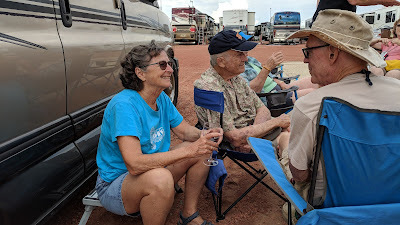 So then, we invited him to join us at the FMCA rally in Gillette. He said, "OK!" We visited the team - George and Scampy - while George was parked at the FMCA rally. We gave him a Geek hat and had him join our Roadtrek happy hour group. It didn't take long before someone exclaimed, "You're Tioga-George?! You've just made my day!" George helped us out signing up members for GeeksOnTour.com when we were in seminars. We even got George up on stage with us during our "How to make a Blog" seminar. He told a bit about his experiences with Blogging. It was great to see George again and get re-connected. I hope we were able to introduce a few new RVers to this legend! We hugged and parted ways after the rally, with no plans of meeting up again. 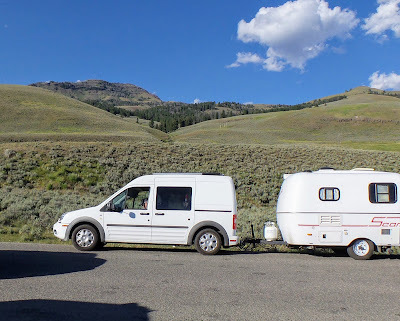 Then, lo and behold, one week later while we were parked on the side of the road in Yellowstone watching Bison - what should we see coming down the road but a Transit van towing a Scamp trailer. Yep, it was Tioga-George! With 80 years and 8 months behind him, Tioga George continues to be an inspiration. Rock on George! Our next "gig" was in Gillette, Wyoming for the FMCA Convention. I love the stretch of road that is highway 90 thru S. Dakota. It's been a few years since we've been up this way and there is a new attraction to see - the Dignity Statue. Friends on Facebook have been posting pictures of this beautiful statue, so I made sure to mark it on our map for a stop. Then there are the crazy sights that have been here forever. 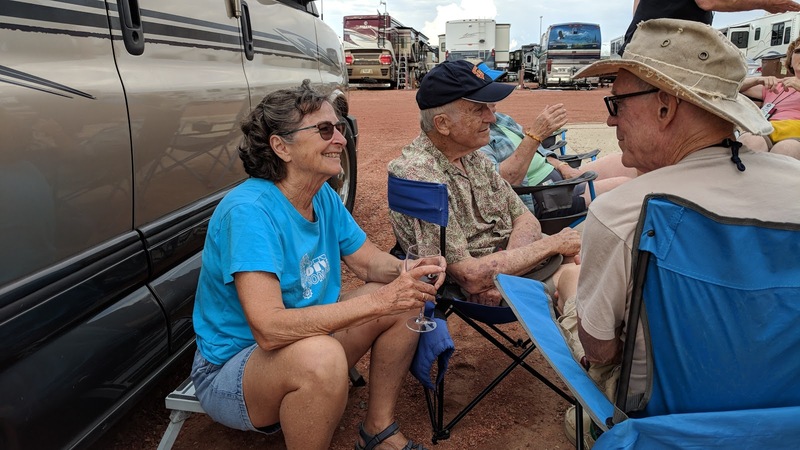 We made such good time on Highway 90 that we were able to rest a bit as we got ready for the rally by staying at the Elks Lodge in Rapid City. We stayed for 2 nights so we had time to go into town and do laundry, and go to the Office Depot to get some printing done for the rally. Our parking spot at the Rapid City Elks Lodge RV park. It's always nice to arrive at a rally early, and rested. And, thanks to being part of the RoadTrek group, we even had a site waiting for us with our name on it! After getting parked, we rode our bikes to the main building and went inside to check it out, and there's our table with our name on it. Life is good! July 4, 1998 Jim and I made the best decision of our lives and started this adventure called marriage. We were in our mid 40s and knew what we liked: Computers, Scuba Diving, and Travel in general. 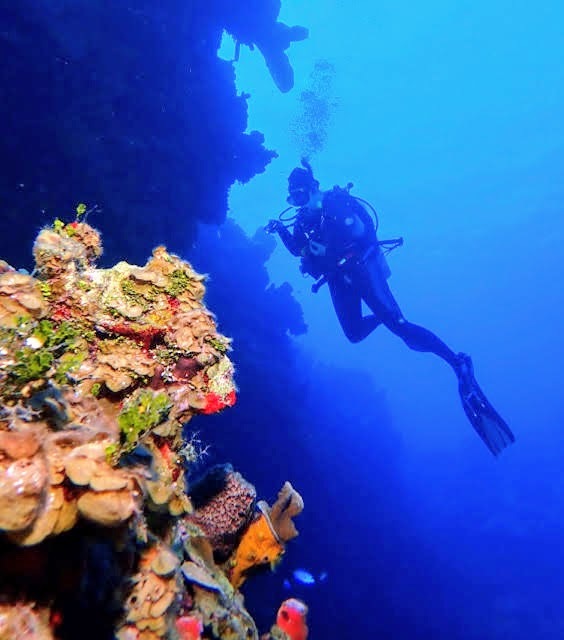 Of those 3, scuba diving is the most special. 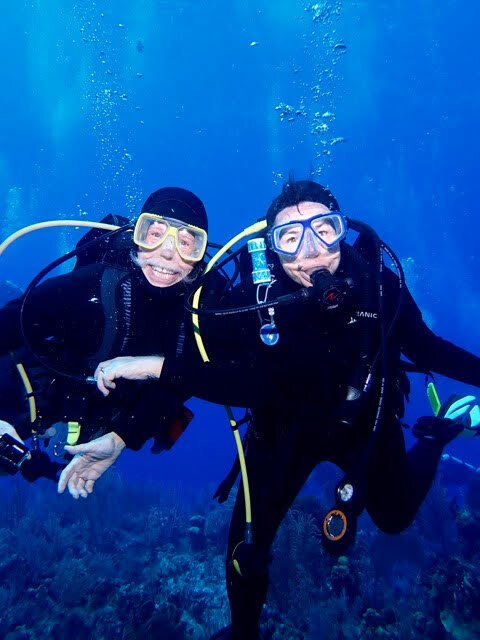 To celebrate our 20 years, we had to go scuba diving! 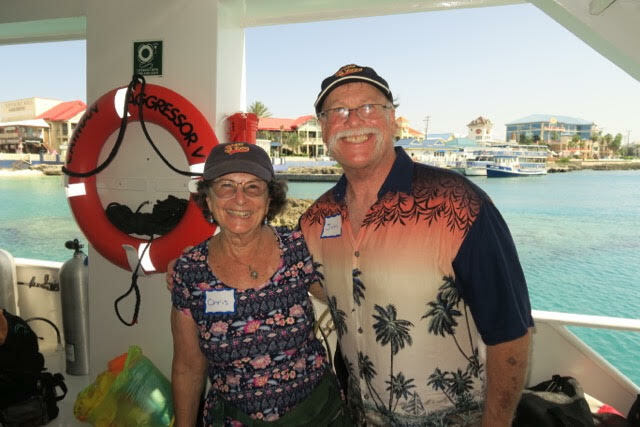 We picked a liveaboard trip in the Cayman islands on board the Cayman Aggressor. We took advantage of a flight/hotel combo and arrived in Grand Cayman 3 days before the boat's departure. That gave us a chance to see some of the sights on the island. 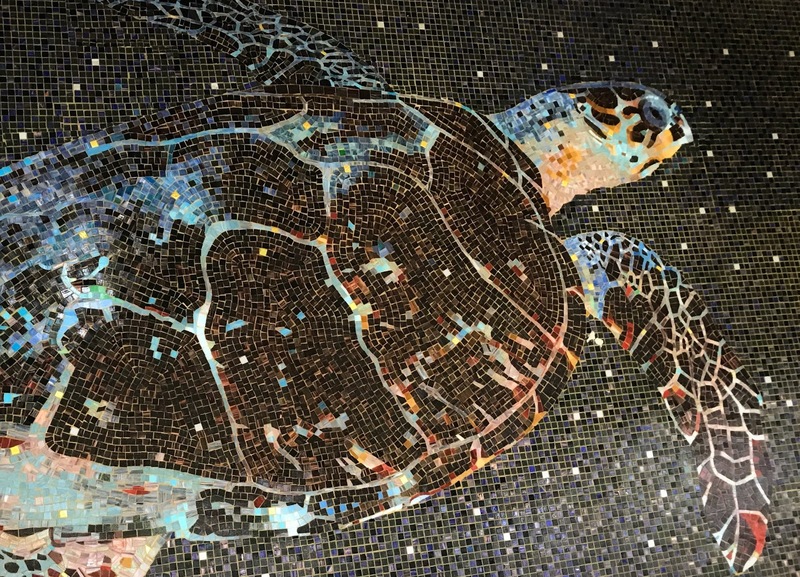 Like the shops at Caymana Bay and the beautiful mosaic artwork on the walls. Our hotel was the Comfort Suites, right on 7-mile beach. Our room did not have a view, but it was a short walk to the beach. 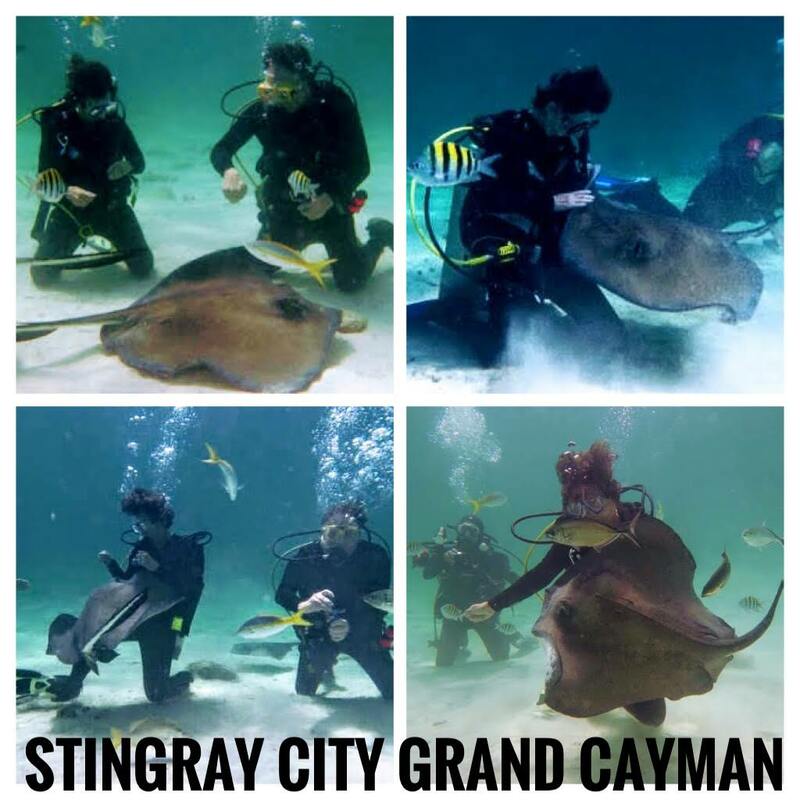 We also visited Cayman's newest tourist attaction, the Crystal Caves. From our hotel, we walked about a half-mile to catch a water taxi over to the north side of the island, then a shuttle took us to the caves. They were really quite impressive. We were very happy to have good Wi-Fi in our hotel room because we had some work to do. Being the end of the month, we needed to get our July newsletter out. We even did a Facebook Live, Gabbing with the Geeks from our room. Another day, we walked a couple miles in the other direction from our hotel to see the docks in Georgetown. We were able to watch the Aggressor as she came in to port with her previous week's divers. It's a pretty big boat, but when it passed in front of the cruise ships it looked awfully tiny. It holds 20 passengers. I took this timelapse video to show you. 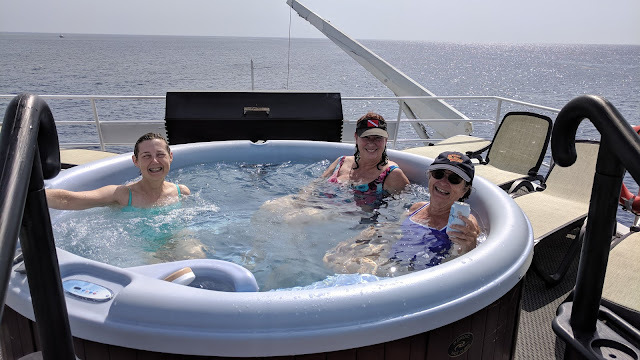 We had a glorious week of great weather, great diving, really good food, interesting people. And, even a little bit of R&R. Ain't love grand?! 20 years later and we couldn't be happier.